The eastern crags of Dow Crag are one of the most impressive sites in the Lake District, forming a dramatic line of cliffs that tower over Goat's Water, and that have attracted many rock climbers. Dow Crag follows the classic Lakeland fell layout, with one smooth grassy side and one dramatic rocky side. To the west the fell slopes gently down to the Duddon, losing 2,000 ft in a mile and a half. To the east the fell plummets down impressive crags, losing 1,000ft in about a sixth of a mile. The crags loom over Goat's Water, from where I find them most impressive, but are also well positions to be seen from the top of the Old Man of Coniston, which faces Dow Crag over the tarn. Dow Crag sits at the northern end of a long ridge of high ground. As you head south you lose altitude and passover Buck Pike, Brown Pike, Walna Scar (better known for the Walna Scar Road which crosses the ridge between Walna Scar and Brown Pike), White Maiden and finally White Pike where it ends rather suddenly. The only other connection to high ground is Goat's Hawse, a fairly deep pass that connects Dow Crag to the rest of the Coniston range. One side effect of the fell's layout is that it only really contains one good path - the one that runs along the ridge from Goat's Hawse to Walna Scar. The eastern crags are really climber's territory (although on my last visit a group of walkers did appear over the edge while I was resting a few hundred meters to the south of the summit, having followed a very steep route between crags). Dow Crag can be approached from either end of the ridge. The southern end of the ridge can be reached from the Walna Scar Road, which runs from Coniston to the Duddon valley (reaching the valley bottom just north of Seathwaite and the Newfield Inn). Goat's Hawse can be reached from three directions. A good path climbs up from Goat's Water, and is probably the main route of ascent. It can also be reached down the path from the old Man of Coniston. Finally it can be reached from the north by climbing up the long grassy but pathless slopes that climb up from the valley above Seathwaite Tarn. Our ascent of the Old Man of Coniston via Goat's Water returns via Dow Crag to complete a nice circuit of the hills above the tarn. The summit consists of a boulder pile balanced on top of the highest point of the cliffs, and the very highest point can only be reached by scrambling up the boulders (on my first visit these rocks were rather too damp and slippery for the climb, but this isn't normally the case). The eastern border is formed by the beck that runs in and out of Goat's Water and becomes Torver Beck. To the north-east Far Gill flows north from Goat's Hawse, forming another boundary. Near Gill is formed close to the summit and then flows north, ending up close to far Gill. A number of smaller becks are also borne on the wide northern and western slopes, most of them unnamed. 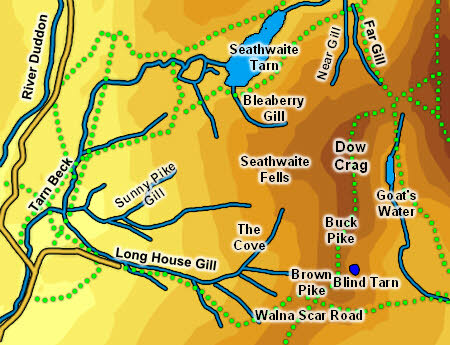 Bleaberry Gill flows into Seathwaite Tarn, but most of the rest end up in Tarn Beck, a major tributary of the Duddon, including Sunny Pike Gill and Long House Gill, which forms the south-western boundary. Tarn Beck forms the western boundary. Dow Crag has a share in two tarns and can climb a third entirely for itself. Goat's Water is the tarn most often associated with the fell, and sits in a splendid location below the eastern crags. To the north-west is Seathwaite Tarn, a reservoir that sits in a steep valley between Dow Crag and Grey Friar. Finally comes Blind Tarn, a small tarn that sits below the cliffs at the southern end of the ridge (east of Brown Pike), and that is very difficult to spot apart from from directly above. The name refers to the lack of an outflow, as no beck flows out of the the tarn.